It was a tiny bit of a library misunderstanding. My son played quietly with the toy trains and the dinosaurs (who knew dinosaurs and toy trains went so well together?) so I sat quietly and read. That’s when I heard two little girls nearby trip along into a conversation pit without realizing it. 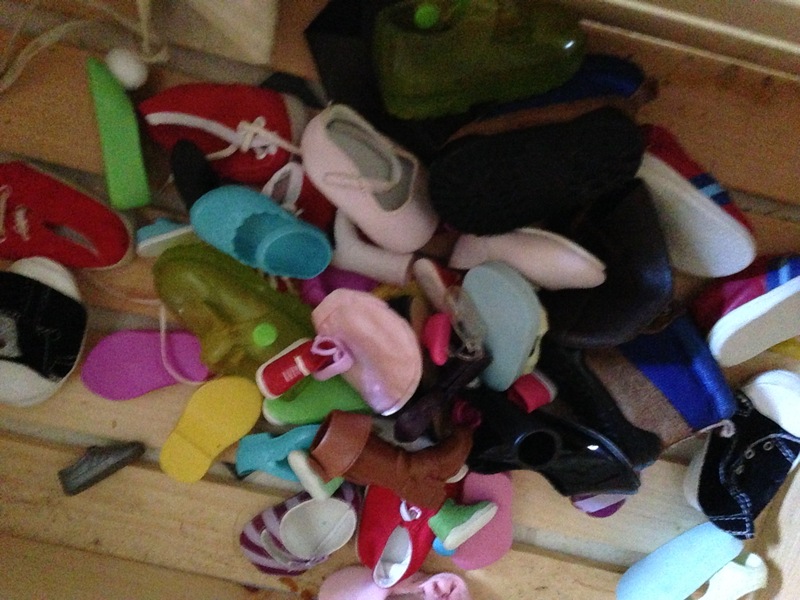 They were only about three or four years old, sweet as can be, with ponytails and pink shoes. Girl 1: Can I play with you? Girl 2: (As she searches the Lego bin for the right block): No, I’m playing Legos right now. We can play later. Girl 1 then pauses just as she was about to pull a chair up to the Lego table. Her face reads surprise, then sadness and a little hurt. She turns away and plays with the farm animals instead. There were no tears and there was no conflict. No one tattled or fought. Each just went about doing her own little thing, unaware of what the other little girl was truly thinking or feeling. Girl 1: May I play Legos with you? Girl 2: Oh, sure! I’m playing Legos right now and I’d love for you to join me. But that’s not what happened. Girl 1 was asking to join in the building fun. Girl 2 thought she was being asked to stop her Lego building and go do something else with her little friend and by golly she was having a good old time making Lego animals right now. Their conversation just missed a little. It’s like they shot two arrows. One went under the target and one went over the target, but no one hit the mark. What resonates a bit with my heart today is when I’m offended or hurt and I let critical words sink deep into my soul, what if I’m actually misunderstanding? Sometimes people say hurtful things and they mean them. Sometimes people say hurtful things without meaning it, but the pain is there just the same. But sometimes people say things and we just miss. We thought they meant one thing; they actually meant something else. And we tote around that offense as a heavy burden, putting up walls of defensiveness in our relationships to protect us from future hurts. Yes, they should be more careful. What you say and how you say it matters. Controlling our tongue and watching our words is a must. What if we were slow to take offense, though? At times the best thing we can do in a conversation is pause. Taking time to respond rather than react can keep us from misunderstanding, from holding onto hurt, and from escalating conflict. I have an email sitting in my inbox right now and I’ll be honest, I’m offended. It is critical of me in ways I feel are unfair. My defenses are up. But I’m choosing to pause. I’ve taken some time to ask, “God, is this true about me?” and I’ve waited and listened for the Holy Spirit’s truth. I’ve considered whether I truly know this person’s intentions. Probably they didn’t mean it this way. 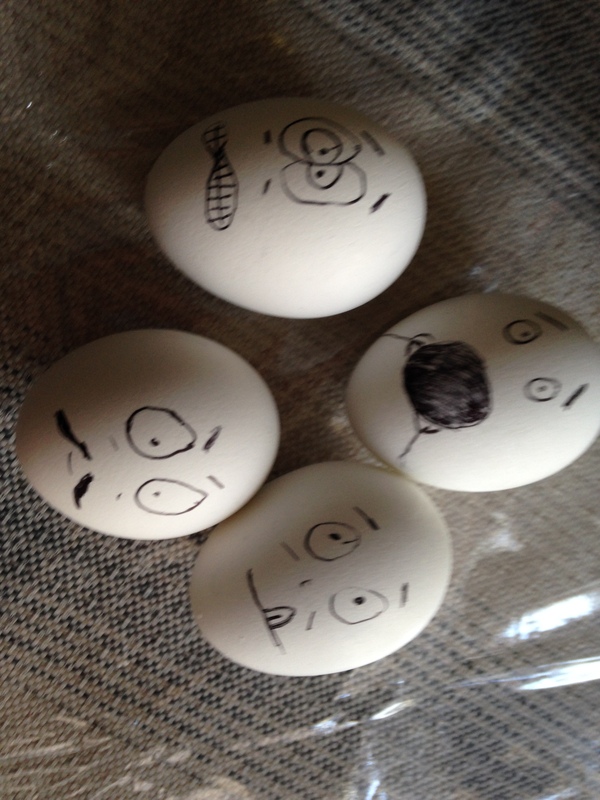 It’s most likely, since I don’t know them very well, that I just don’t understand their humor or perspective. Good sense makes one slow to anger, and it is his glory to overlook an offense (ESV). Do not take to heart all the things that people say, lest you hear your servant cursing you. Your heart knows that many times you yourself have cursed others (ESV). We live in an easily offended world. People curse you for simple mistakes and seek vengeance for misunderstandings and accidents. We are so often quick to anger and quick to speak, leaving behind the wreckage of broken relationships and the ache of loneliness. I want instead to say little and to listen much. Sometimes I fail. I am easily bruised by the criticism of others. And yet, when I filter the comments of others through the gauze of grace, I can grab hold of truth and let the rest go. I can respond with more love than I was shown. Pausing gives us time to choose humility and wisdom, grace and gentleness, and it helps us hit the mark instead of missing and messing up. My oldest girl gave a speech that was bursting with righteous indignation. Her class had misbehaved in the school lunchroom. These fifth graders had been out of their seats, standing up on the little round chairs attached to the lunch tables. They had been loud and obnoxious. It wasn’t just the misbehaving few, though, who bore the load of consequences. Oh no, the whole class had to write a letter of apology to the lunchroom monitors. And that wasn’t fair, my daughter said. Why should she apologize for the bad choices of others, for their immaturity and out of control actions? She had sat there quietly eating her lunch. That kind of thing, the kind of line-in-the-sand distinction between the righteous and the unrighteous, the right and the wrong, the worthy and the unworthy, the good and the bad. We’re experts at these kinds of distinctions. We draw lines politically. We draw lines socially. We draw lines at work and maybe at church more than anywhere else. We know those prayers don’t include us, of course, not the good and holy ones who clearly have earned God’s favor. Yet, I challenge my black-and-white, rule-following, fairness-and-justice-demanding daughter with a prayer from the book of Daniel that’s a shock to pride and self-righteousness. Not Daniel, of course, but masses of people had been traipsing after foreign gods and stone idols for generation after generation. Israel had disobeyed the law and dishonored the temple. Not Daniel, of course, but so many others had turned their backs on God, choosing blasphemy and rebellion instead. God finally declared, “enough is enough!” He disciplined his people by allowing them to be conquered, the temple destroyed, His people taken away from their homes. Now Daniel was in Babylon, one of the first to be carted away from his home and taken into captivity in a foreign land. He was now a subject of pagan kings, living and working in an environment often hostile to his faith. Daniel bore the full weight of God’s punishment for his people, but he hadn’t done anything wrong. He was a sinner, of course. We all are. Yet, he hadn’t committed idolatry. He hadn’t defiled himself. He hadn’t sacrificed children to Molech or bowed down to Baal. “Alas, O Lord, the great and awesome God, who keeps His covenant and lovingkindness for those who love Him and keep His commandments, 5 we have sinned, committed iniquity, acted wickedly and rebelled, even turning aside from Your commandments and ordinances. 6 Moreover, we have not listened to Your servants the prophets… (Daniel 9:4-6). She didn’t do anything wrong, yet could she humble herself enough to set aside the ‘fair’ and ‘just’ and choose the low and the merciful and the heart of intercession? Could she make that choice like Daniel did? When we pray for others and when we pray for our nation and for our churches and our communities, our husbands, our kids, our family, our friends, can we choose to pray with them instead of praying while looking down at them? And we know this truth, that God doesn’t wash us clean because we deserve it, not because we’re good enough or holy enough or righteous enough to merit grace. How could this change the way we pray for our marriages, families, churches and nation? I held off as long as I could, longer than I ever have before. I’ve taken down the summer wreath from my door, the one in nautical blue and white stripes with seashells and an anchor. In its place, I slipped up the fall wreath, a sign to everyone who comes to my door that I’ve finally accepted the end of summer. Usually, I’ve baked two or three batches of pumpkin bread, ginger spice cookies and pumpkin pie by now. Maybe I’ve made baked apples in the Crock-Pot. Not this year. Not one pumpkiny, gingery, cinnamon-heavy, apple-based dish so far. 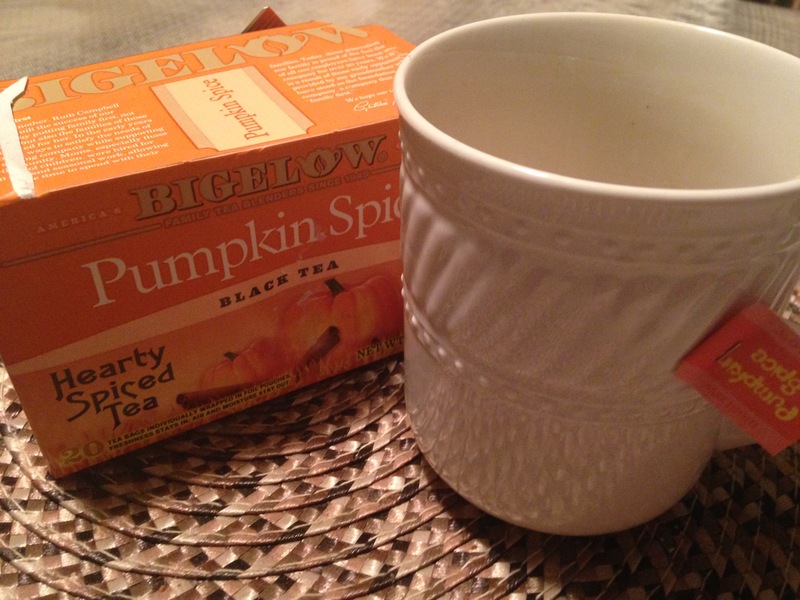 But I did finally pour the steaming hot water into my mug with a pumpkin spice tea bag as a treat before bed. And, I’m stocking up on baking supplies and the chocolate, graham cracker, and marshmallows we’ll need for S’mores. Maybe I’ll even make this all official by unpacking my leaf-and-pumpkin decorations and dotting them around the house. Fall is my favorite season. I could be happy in sweater weather all year long. The pumpkin patch is my happy place. Baking season is heaven to me. Walking among the crunching leaves, tucking away acorns and pine cones as treasures, smelling the scent of fireplaces carried by the wind, is deeply healing to my rushed soul. But this year, unlike any year I ever remember, I’ve been holding onto summer with both hands, my feet firmly planted. The calendar is all-out dragging me along and you can see the grooves in the dust where my feet refuse to move. School is in session, but I’m pretending it isn’t. I’m going through the motions: homework, agendas, reading logs, packing lunches. But my brain is still thinking beach, daytrips, rest. I can’t recall any time I’ve gripped so desperately to a passing season. And there’s the thing, the essential truth in all of this: These seasons, they do pass. It’s this inevitable moving on in life. Usually, I’m a move-on kind of girl. Sometimes, though, we are so trapped by looking back that we’re missing the beauty of now. Maybe that’s me. Yesterday, it was 66 degrees outside for my morning walk. Yet, what if I stubbornly refused to enjoy it, whining and complaining all the while about the lack of bathing suits, a water park, and the long summer nights? Well, I’d miss this, of course. I’d wake up one morning to temperatures below freezing, I’d be hurled into snow days, icy road conditions, and the layers and layers and layers of clothing I’d need to put on my children before sending them out to the school bus in the morning. Maybe we hold onto seasons because we don’t like change. Any change. Maybe we just ‘know’ that what’s coming isn’t as beautiful as what’s been. Maybe I woke up one morning after my oldest daughter’s ninth birthday 9 and realized I’m halfway to her leaving my home and heading off into independence and college and a world with less mom in it. So, what mom wouldn’t want summer to last just a little bit longer when that same girl is now starting her last year in elementary school? May the Lord be praised! 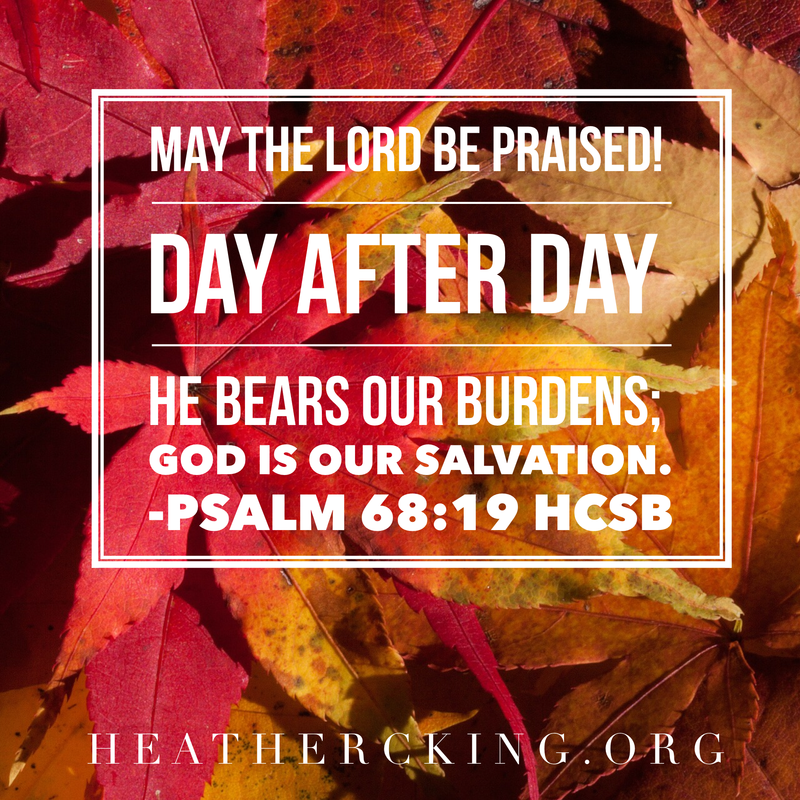 Day after day He bears our burdens; God is our salvation. Selah (Psalm 68:19 HCSB). Day after day, God is at work in me. Day after day, He is bearing burdens for me, lifting me up, helping me forward, walking alongside me. This daily gift tells me that anywhere I go, any season I’m in, every time I leave something behind and begin anew, He is right there with me. The blessed place isn’t where I’ve been; it’s anywhere He is. I’ve been re-reading the story of Ruth lately, how she left her home in Moab and traveled to Bethlehem, to a foreign nation and a strange people with her mother-in-law after the death of her husband, her brother-in-law and father-in-law. She could have stranded herself in mourning or imprisoned herself in the past. She could have arrived there with Naomi and holed herself up in her room, crying from homesickness and wallowing in loneliness. “Let me go to the field and glean among the ears of grain…” (Ruth 2:2 ESV). She fully engaged in the act of living in this place at this time in this very season. She basically pulled out the pumpkin spice tea, nailed up the “bless this harvest” sign, and baked a loaf of pumpkin bread. So, that’s what I’m doing, too. My son lost our dustpan last week. This is the second dustpan he has lost. I do not know how these things happen. There really is no logical explanation, but my dustpan is lost just the same. One day, I pulled out the broom, dustpan and mop and attacked the kitchen floor with cleaning vigor. Then my son ‘swept’ the floor and ‘mopped’ it himself in a little game of pretend cleaning. I, of course, did not stop this child because a little tiny boy who thinks chores are fun could grow up into a responsible adult. So what if he just pushes the broom around the kitchen to no effect? That is, it’s adorable until you put the broom back in the closet and realize the dustpan is MIA. I mean, really, how well can you hide a dustpan? It’s such an awkward shape and it’s too large to fit into most of the drawers and stashing places around my kitchen. I shrugged it off at first, figuring it would just turn up as I cleaned later that day, or week, or whatever. Last time this happened (yes, there was a last time), I broke down and bought a new dustpan the following week. This time, I kept hoping I’d find the top secret hiding place where he is stashing these things. Then, maybe I’d have two dustpans and new-found knowledge to help me prevent this crisis in the future. Of course, now I’m truly appreciating the full value and utility of a really good dustpan. Without it, I was sweeping my kitchen floor dirt onto a piece of cardstock paper, until I finally broke down and paid the $1 for a new one….again. And I’m thinking how many days I just swept my kitchen floor without giving that dustpan a half-second of thought or appreciation. I just used it. It’s a cheap, plastic tool, and I had no idea how much easier it made my life. What have you been overlooking? What have we been taking for granted, using without gratitude or appreciation or even worship? What have we been grabbing out of our storeroom Christian closet and putting to work without fully valuing its impact or purpose? The first thing I want you to do is pray. 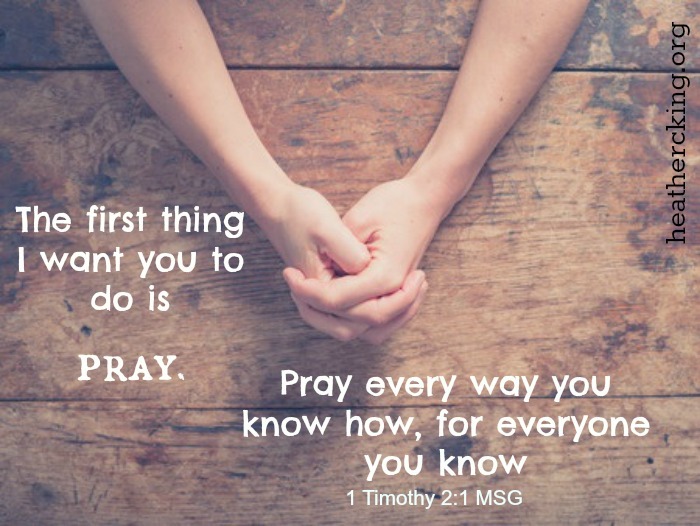 Pray every way you know how, for everyone you know ( 1 Tim. 2:1 MSG). Maybe you’ve been taking a spiritual gift for granted or you’ve trudged into church on Sunday or even just skipped the service and opted for a morning nap. Perhaps your Bible is dust-covered and serving as a nightstand paper weight. Or maybe you’ve stopped writing notes of encouragement to others or calling your friend or your sister and sharing a cup of coffee. We do this. We get busy. We grow complacent. We do what we’re supposed to do without passion or joy just because it’s what we’re supposed to do. We grab the appropriate tool, use it, and stash it back in the closet for the next cleaning day. But I return to Paul’s words about prayer and I start here today. I’m thankful for prayer. I want to acknowledge the power of it, the blessing of it, the gift of it. I want to pray first, not second, not after I’ve tried everything else, not as a last resort or in one desperate act of hopelessness. I want to pray about everything, not just what’s spiritual and holy or big enough to garner God’s attention. Everything. Every minor annoyance and daily need, every concern over my children, each new day and all it brings and the ministry God lays at my feet. The disciples watched their resurrected Savior ascend into heaven and heard His command to wait for the Holy Spirit. They walked down off of that mountain and journeyed straight to Jerusalem. 13 And when they had entered, they went up to the upper room, where they were staying… 14 All these with one accord were devoting themselves to prayer… (Act 1:13, 14 ESV). They went right to prayer. They devoted themselves to it. They lingered there. Then, filled with the Holy Spirit, Peter delivered the sermon of all sermons. For ten days the disciples prayed. Ten days of prayer plus a few minutes of preaching led to three thousand saved souls. Perhaps we invert the numbers. We’re prone to pray for a few minutes and preach for tend days. Not the apostles. The disciples didn’t pray for a preaching service. They just prayed. They treasured God’s presence, recognized His power, and acted because of His Spirit in them. Pray for everything (yes, including the missing dustpan). Pray, not for God to make things happen your way, but for God to be at work His way. That’s the standard reply my five-year-old gives me. Would you like to take ballet again in the fall? Do you think you would want to try this? She has this timeline of plans, this plotted course, and she’s not really in a hurry to jam-pack activity into this very moment right here. Seven is soon enough. Ten is fine. Why try to do everything when you’re five? Part of me marvels at the wisdom. What is it about me that tries to cram what feels like a life-time of living into every single day? Something about me that cannot…..can….not…..leave the dirty dishes in the sink for the next morning. I’m the anti-Scarlett O’Hara. None of this, “I’ll think about that tomorrow” nonsense. Today. Today. It has to be today. I have to slip into bed every night, to-do list cleared out, dishes clean, laundry put away, nothing holding over for the next morning. But my tiny girl lives out today and is content to let some things linger until tomorrow, or next year, or five years from now. Today, she’ll do this. And then one day she’ll do that. Simple as that. Part of me, though, worries: What if I leave that for another day and that other day never comes? Our lives are short. Our future uncertain. Our tomorrow is never guaranteed. And if you leave too much left undone today, it just spills over on top of tomorrow and then the next day until it’s a 10-car pile-up of trauma and disaster. I need to handle this and do this now, now, now! We are a mixed-up bunch: Our priorities, our timetables, all jumbled and topsy-turvy. We think what we’re doing right now, this moment, this day, this season, this year, this project, this commitment, this ministry…is the end-all be-all. It’s what keeps us up at night and what forces us out of bed in the mornings. And yet, as Christians, the moment we choose for Christ to be our personal Savior, eternity with God begins. It doesn’t start the day we die here and walk through heaven’s gates. It begins that moment we bow our heads and our lives to His Lordship. This very issue that leaves me sleepless and fretting or over-stuffing each day is a tiny speck in the grand timeline of eternity with Jesus. And all those five-year-plans and ten-year-plans and budgets and agendas, hardly matter in the big picture of forever. Our hearts long for this. Truly. 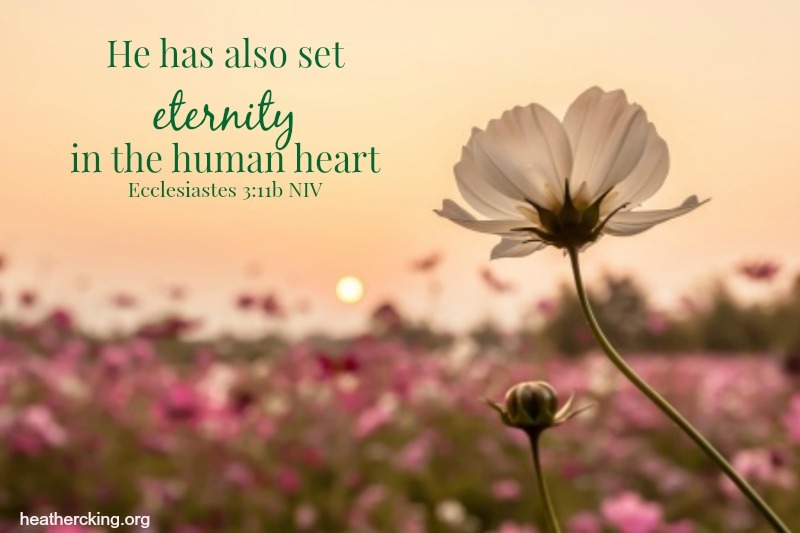 He has also set eternity in the human heart (Ecclesiastes 3:11 b NIV). We struggle to keep it all in balance and yet God breathes that refreshing breath into us, the reminder that THIS is not all there is. The way the days sometimes stretch out in endless frustration or rushing or stress…that’s not forever. That’s nothing more than a blip on the radar screen of the eternal. Or the way one trial, a season of loss or pain or want, overtakes our life, and yet it’s here for this moment, and then it will be gone. Every moment feels a little more sacred. Because the life we’re living in the here and now is just part of that eternity with Jesus. We can love Him, know Him and worship Him, spend each day in His presence, and that forever-life shifts our perspective. This situation. The to-do list. The appointments. The schedule. The annoyance. The personal hurt. The betrayal. What matters most is yielding to Him. It is listening to His Spirit. It’s sharing a laugh with God or marveling over the beauty of His creation. It’s rejoicing over the salvation of another. It is dumping the sin out of the trash-bin in my heart. 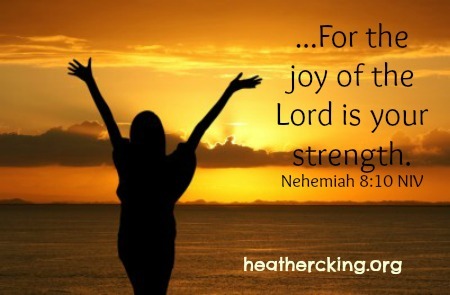 It is allowing God to construct peace or patience or joy in my life. What matters? What doesn’t? It’s all a little clearer in the light of heaven. Our intention had been to make the 3-hour drive as a family, but a stomach virus incapacitated 3 of my 4 children, so it was just mom and daughter in a minivan for hours. We had plenty of time to talk about life, love, growing up and superior travel snacks (AKA Twizzlers). She’s 10. She’s thinking ahead. This is a good thing. I tell her how I volunteered at my local library for years, babysat, and then my first real job was working as a legal assistant at a law firm. “WHOA.” She stops with her hamburger halfway to her mouth. Was it my eye-catching resume, my extraordinary job interviewing skills, or some career-launching internship that I had snagged in middle school? Be faithful with what you’re doing right now and leave the future to Him. That’s what I tell her. I’m a do everything you’re supposed to do and more, work until you collapse from exhaustion, pack every day totally full and then spill the to-do list over onto the next day—kind of person. As a mom, I fight Pinterest-depression because of everything a good mom is “supposed” to be doing. As a writer, I’m supposed to Tweet and Facebook post hourly, pin on Pinterest 3 times a day, read 5 or so blog posts every morning and comment to them, write my own blog post every day, guest post to other blogs, send query letters and book proposals out monthly, write articles, write books, attend writer’s conferences, and read and study enough to make sure I have something worth saying. My house is not organized. I lose my temper with my kids at times. I let my kids play outside some days instead of making them practice the piano. I do not schedule enough play dates. 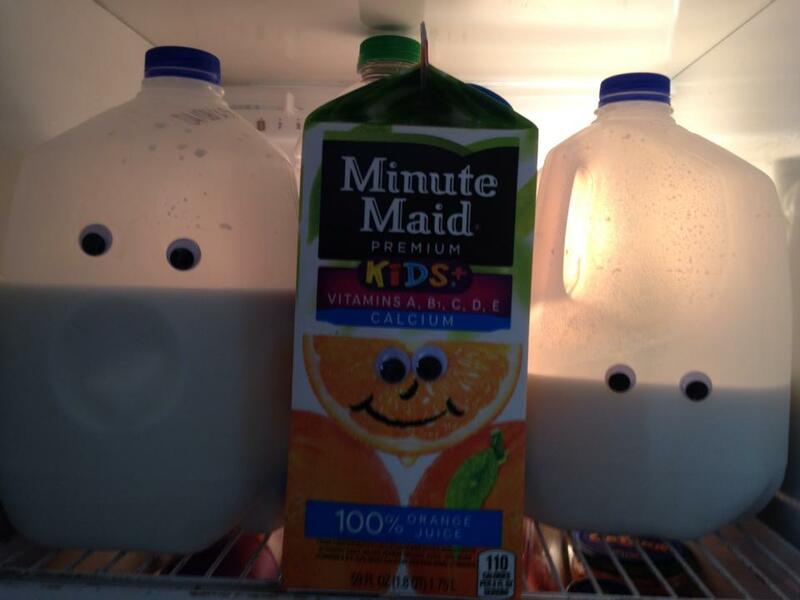 I am sometimes too-much-mom and not-enough-wife. And as a writer, well, let’s just say Twitter and I aren’t the best of friends. So I’m talking with my daughter in the minivan about my first job, using the moment to teach her, but I’m also speaking truth to my own weary heart. You don’t have to be a striver. God doesn’t ask you or expect you to do everything. He asks that we faithfully do what He’s called us to do. Just that. When we pack extra burdens down onto our shoulders of ‘must-do’s,’ should-do’s’ and ‘have-to’s,’ we collapse under the weight. They had stayed up all night fishing, working hard with nothing to show for it. Their fishing expedition was a capital-F Failure. Their nets weren’t faulty. Their boat wasn’t to blame. They had the necessary skills. The location was fine. They did what they were ‘supposed’ to do. They had slaved away trying to force success and make something happen, all in their own effort, trusting in their own skill, know-how and sweat. In the morning when Jesus told them to go put out those same nets off the side of that same boat, they probably blinked tired eyes in disbelief. “You say to put the nets in the water, so I will” (Luke 5:5). God brings abundance when we bring obedience. They didn’t have to fish all night. They only needed to fish when and where Jesus said. That’s when He loaded them down with enough fish to snap their nets. I will be exalted among the nations, I will be exalted in the earth” (Psalm 46:10). He’s going to be exalted. Not because we worked hard to exalt Him. What has God called you to do today? Do that. Put your whole heart into it. Be faithful and passionate and focused. Be obedient. Trust Him with the future and stop trying so hard. Sometimes she’ll get really wild and crazy and say something totally unexpected like, “I have a headache.” That’s just to keep us on our toes. But when she started complaining this week of a stomachache, I fell into my normal mom-stance of skeptic complacency. Sure, a stomachache. So what else is new? But it was new and different. It was for real this time, a true illness that would confine her to the couch with a bucket for three days and counting. How complacency blinds us and binds us! One minute we’re living out the daily routine blindfolded and half checked out and the next minute we’re thrown awake, eyes wide-open, forced to pay attention. Oh, for real this time. This isn’t the normal. This is new. And we need to be shaken awake. God didn’t design us to live life and live faith halfway asleep and mostly disengaged. He wants our full attention. So, He’s not above surprising us sometimes. Maybe David needed a surprise like that. When King David announced that the Ark of the Lord should be brought home to Jerusalem, the priests should have followed proper protocol. Instead, they loaded what probably seemed like an old and generally meaningless relic from bygone days onto a cart and sent it on down the road. They broke the rules. God told them exactly how to handle His presence—carried on poles on the shoulders of priests, not bumbling down a bumpy road in a cart entrusted to animals. So, when the Ark started to tumble off onto the ground, Uzzah the priest reached out to catch it, thinking surely he was doing the right thing, the good thing, the honorable thing. But he was struck dead by the holy might of Almighty God. No one should have touched the Ark. Not ever. Uzzah should have known this. He was a priest, a Koathite priest, a descendent of Aaron himself. The ark had been kept in the house of his father, Abinadab. He had grown up with it. Which may be the best explanation for his actions…..The message: don’t grow lax before the holy. God won’t be loaded on convenient wagons or toted about by dumb animals…. King David snapped to awake. Of course, he snapped to anger also, exploding at God about the injustice of Uzzah’s death. And then He worshiped in awe. The truth is, all those years living in the same house as the Ark hadn’t impressed Uzzah; it had made him complacent, like he was handling little more than a dust-covered knick-knack from a living room shelf. 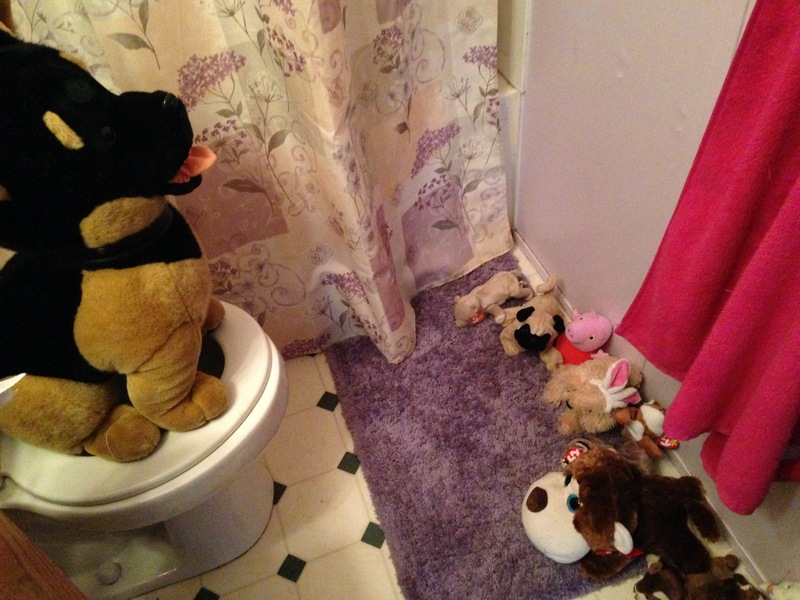 All those years living in the same house with my daughter, and she still manages to surprise me. All these years of marriage, I still discover my husband and could there be any better than falling and falling and falling in love? And, all these years with Jesus, surely He still surprises. And amazes. Just when you think you know what size box God fits in, He loves to show off His might. Just when you think you know how far faith will take you, He asks you to go farther. Just when you think you understand how deep His love is, He draws you down deeper. his greatness no one can fathom (Psalm 145:3 NIV, emphasis mine). God sure can surprise us. In fact, He can shock us right out of our socks and shoes some times. How much better, though, to lean in and listen…. To quiet our restless hearts…..
To pause and deeply look…. To awaken to the holiness of God and live life in awe of His presence, expecting His glory this very day, this very hour, this very moment. Sometimes I’m afraid to pray those ‘dangerous’ prayers even when I know deep-down that’s what I should pray for. 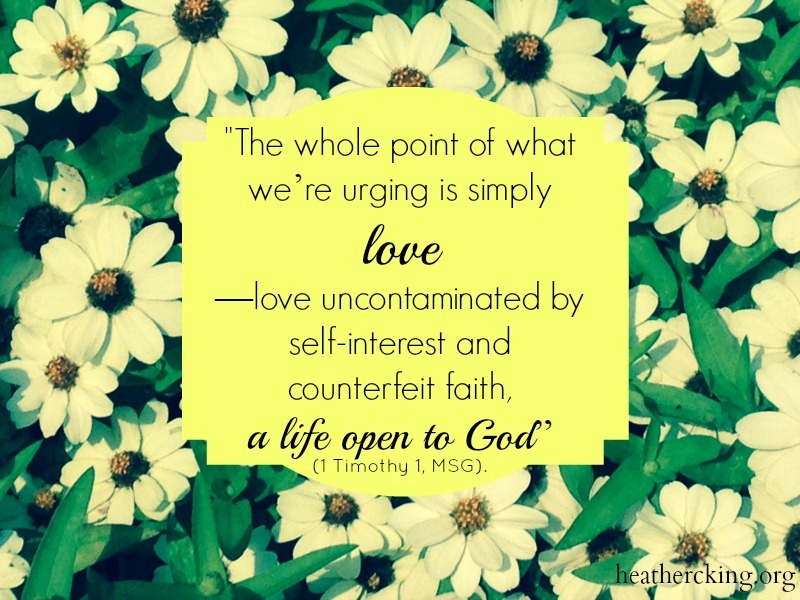 But it’s like giving God permission to interrupt my life, letting Him move on into my heart and mind with cleaning supplies and uncover all the dirt I’ve hidden away. So, I sat there holding the prayer card, debating whether to write the truth down. I’ve been making these prayer cards for my family, friends and others I pray for. I have a card for my husband, for each of my children, one for the unsaved, one for church and another for Bible study, and a card for me. The cards are growing over time. I scribble down my requests for my kids and then the next day I find the perfect verse to pray, so I jot it down on the back of this 3 x 5 white index card with a Sharpie marker. I’m not writing the little requests that change day-to-day: a fever, a bruise, a big math test. These are the prayers about character and life, big decisions,using their gifts for God’s glory, spiritual growth and their future. For each child, I know what I need to pray. One needs to grow in forgiveness. Another in self-discipline and overcoming fear. Another in being teachable and accepting grace. But I pause, my hand hovering over the card. Do I write down’forgiveness?’ What if God allows my daughter to be hurt because of my prayer? What if He allows pain so deep that she has to fight through bitterness to choose to forgive? What about “teachable?” Do I dare write that down? What if God humbles my daughter through excruciating failure, brokenness, and the lessons of humility? We Christians have joked about it so often, “Don’t pray for patience!! !” That’s what we remind each other and then we laugh in agreement because, truth is, God has taught us all some of those painful lessons in patience. And we didn’t like them. So, we’re afraid to pray. Yes, I am afraid to pray, too. I know why. It’s a trust thing. I’m not believing the best about God. The truth is that God won’t bruise or break if a gentle lesson, a sweet whisper could change our hearts. He never answers our prayers for patience with trials just because He’s mean like that. Or He likes to hurt us. Or He can’t come up with another way to teach us. If I pray for my daughters to grow in these areas, I can trust Him to teach them in the best way, the perfect lessons at the perfect timing, and if their hearts are yielded and moldable clay, He’ll use the gentlest touch to fix the imperfections He finds. And the truth is that if it’s breaking we need, He’ll allow the brokenness so that He can reshape us and form us into something beautiful: into the image of His Son. But even then, I can trust His hand. I can trust His love for us and the grace He pours out and the way He never gives up. As I read in Genesis, I think how Jacob must have been so afraid. I recognize it now as I look at him: one fear-filled human looking into the heart of another fear-filled human. Jacob lost his son Joseph. So, when his remaining sons trekked off to Egypt for food during an intense famine, he had one demand: They had to leave his youngest son, Benjamin, behind. He couldn’t lose another son. Not ever again. It seemed to work at first. The boys brought home grain from Egypt and the youngest son stayed home. But the food ran out again and Joseph had made it clear—-no younger brother in Egypt, no more food. Jacob either needed to trust God or his whole family would starve. And God let Jacob reach the very end of all his resources so that Jacob would finally let go of control and send all his sons back to Egypt, Benjamin included (Genesis 43). This was God at work. Jacob was terrified, but God was in this. He was working for the reconciliation of Jacob’s family and the preservation of the entire nation of Israel. But as long as Jacob held on tight to control, not wanting the possibility of pain, he missed out on God’s best. We can trust God with our hearts, with our lives, with our children, with our marriages. We can trust Him with all of it. 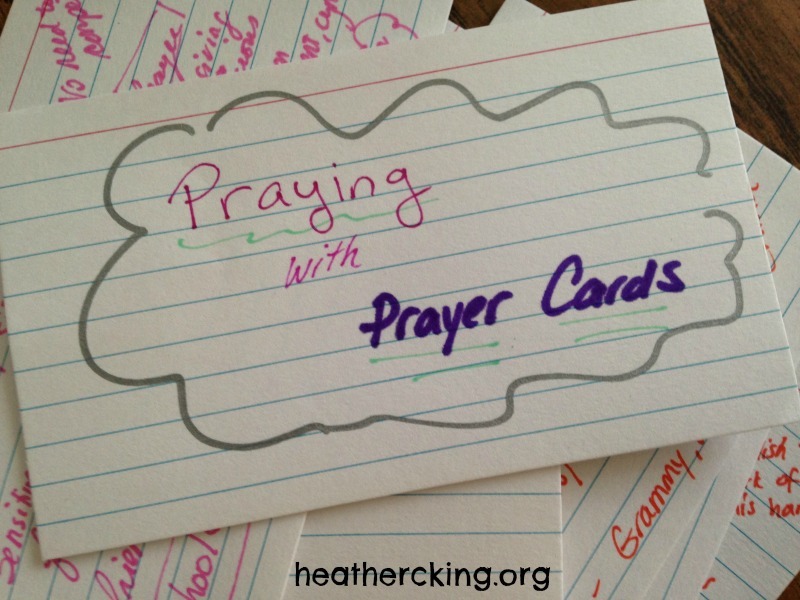 So, I write down those prayer requests on the prayer cards and I entrust my children to His care. I tell Him that I’m afraid. I tell Him the truth about what’s in my heart. But I trust Him and I let go. Want to learn how to pray with prayer cards? I first read about them in Paul Miller’s book, A Praying Life.